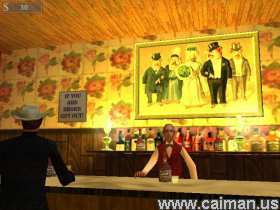 Caiman free games: Lost Dutchman Mine 3D by Rod Fisher - Attic Games. Every once and a while a game comes along that has style and great gameplay, well this is one of them. Lost Dutchmans Mine 3D is an excellent 3D adventure that involves you as an old timer trying to make his riches in the old wild west. Your adventure starts around Superstition Mountains of Arizona where you will have to survive thirst, hunger, rattlers, bandits and Indians to make your fortune. 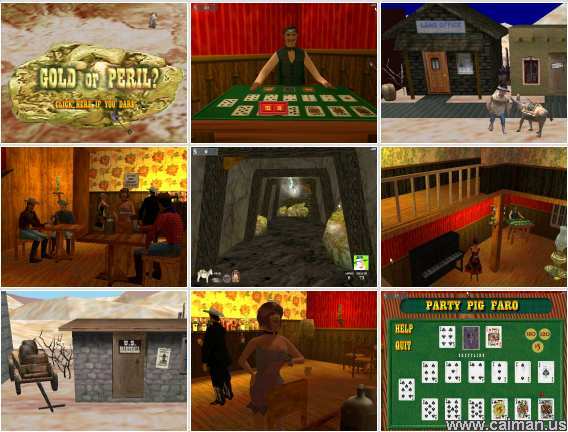 You can get rich by panning for gold, finding mines, or gambling Faro in the saloon bar, you can even have a drink to refresh you thirst. To help you along the way to find the Lost Dutchmans Mine you must collect 4 map stones. 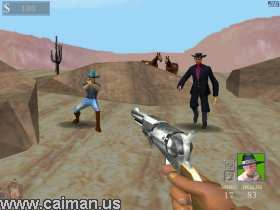 There is alot to this game than meets the eye as you have to keep your health up while making money but beware of the bandits and Indians that will rob you of your gold and could start a gun fight. Decisions must be made and made quickly when in the desert. Decide wisely and you could end up with your fortune. The 3D graphics are wonderful as well as the in game music that blends in great with gameplay, you could even get a laugh or two out of this excellent 3d adventure.